Fall has finally arrived. Let's hope the weather follows soon! We are devoting the month of September to an often neglected and problem area of our homes. You guessed it... the closets. For 4 weeks (every Thursday in the month of September) we will pick a specific closet to focus on in your home. Our blog will feature inspiration and tips to help you conquer your closets one week at a time. We want to see your completed projects each week! Post a photo to Facebook or Instagram (by the Monday after the blog is posted) with the hashtag #HYDFallChallenge . We will pick one random winner each week to receive the prize of a lovely HYD Canvas Tote! Because your closets need some love every now and then. Because you will create space in your closets for the things you need and love. Because you might win a beautiful HYD canvas tote. Because purging and creating space in your closets will inspire you to declutter other areas. Because donating and giving back to your community is life giving. Begin by taking everything out of the closet (or cabinets). Separate the contents in a way that makes sense to you. Discard- the torn towels or worn out sheets that you'd rather use in the garage or to dry off the dog. These can be put in a new place- laundry room or garage. Occasional Use- the towels, sheets and blankets you only need when you have multiple house guests at one time or when the whole family goes on a trip. These could be better stored under a bed in a vacuum seal bag. Table cloths might fall into this category- try to find a place closer to the kitchen such as the top shelf of the pantry. Necessity- the ones you use every day. These are the ones that deserve a prime spot on the shelf in your laundry room. The trick here is that you don't need excess. Only have on hand, what you need and use regularly. Let your kids pick their favorite towels and blankets and find a shelf they can easily access. Donate- Challenge yourself to fill a few grocery bags or even a trash bag of linens that you can part with. Our local KARM stores would be a great place for these to end up. Put back the contents that are here to stay. Show your family members or roommates the new linen closet system! Keeping it practical this week with a short checklist on how to get your bathroom storage in order. This is a great activity to help you feel a sense of accomplishment that doesn't require a big time commitment. It's a favor you can do for yourself that keeps on giving when your mornings are rushed and you need to be able to get through your morning routine as smoothly as possible. 1. Pull everything out of every cabinet and drawer and group in categories. You always need to see how much of everything you have to know how much to keep. Clean out the drawers and cabinets once they are empty. 2. Try not to spend too much time thinking about how much varying items cost. If you don't use it, if it's old, or if you didn't like it's result, let it go. It's not worth the space it's taking up if you don't or won't ever use it. 3. Go through all makeup, medications, grooming tools etc. and check expiration date. Do you have multiple bottles/tubes of the same item? How many will you realistically use before they expire? If you have several half used bottles of the same thing, consider consolidating them to save space. 4. If you have drawers full of sample sized or hotel sized hygiene items ask yourself whether you will use them. Yes, they were "free" with that $100+ night at the hotel, but if they're collecting dust in the drawer, you've had it so long you can't remember which hotel it was from, or you don't even like it....toss it. 5. If you have the space on your sink or countertop, a tray, like this one, of your most used and pretty products can be a nice way to store items. If not, this caddy showcased by Martha Stewart is a great option for those of us that lack storage space. 6. Linens. Go through your towels. Do any need to be replaced? Consider using old towels for rags. If you already have plenty of rags, donate the towels. How many towels do you use? How many do you need? If you keep sheets in the bathroom do the same thing. So often, we keep sheets and towels that don't match others or that we never use. Make sure to have enough for each inhabitant in your home and a set for guests, but there's no need to keep more towels or sheets than you actually use as they just get musty in the cabinets and take up valuable storage space. 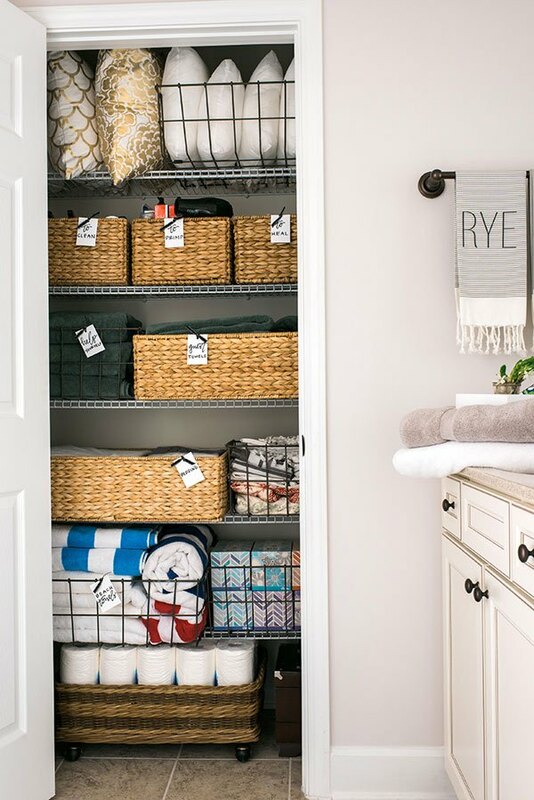 The best way to stay successful with bathroom order is to use small containers to group items, especially if you have a closet with larger shelves. Clear shoebox size boxes work well, grouping medicines together, first aid in another, grooming supplies in another, and so on. If you have children, grouping their medication in one and the adult meds in another makes for quick retrieval when a child needs meds fast or in the middle of the night. For smaller items, a portable drawer system is great as well. Using a labeler or adding a cute tag to each unit finishes it off just right. Hopefully this will help you to take on your bathroom organizing project with the tools you need to be successful. If you're still feeling a bit overwhelmed or just don't have the extra time, HYD is always here to help!